Sunday's post In Search of the Fresh Meadows Toll Booth: Part I documented that the Motor Parkway designated two new "toll lodges" in Queens when the Nassau Boulevard entrance was opened on July 1, 1928. 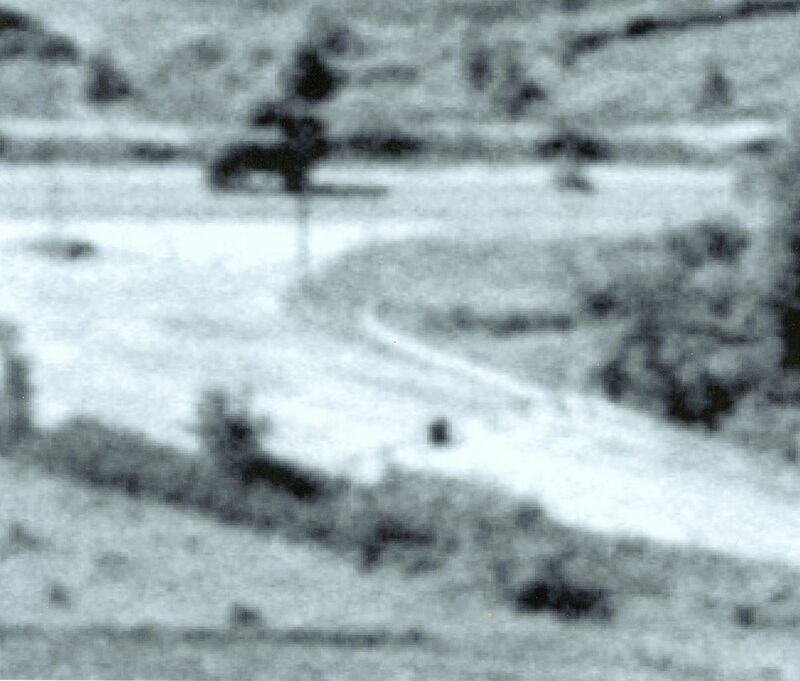 The existence of the Rocky Hill Road Toll Booth was confirmed in both aerial photos and a dramatic ground-level photo. Tuesday's post In Search of the Fresh Meadows Toll Booth: Part II began the search for its sister toll booth at Nassau Boulevard. Tonight, more amazing images appear for the first time on the Internet and I will offer my best opinion about this elusive Queens toll booth. After paying my respects to the ruins of Shea Stadium, I spent the day at the nearby New York City Parks Photo Archive and found some several significant images and maps. 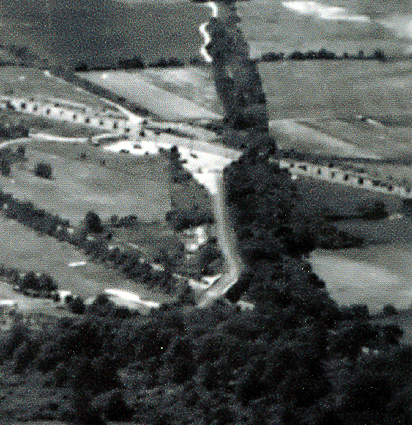 The above 1938 Fairchild aerial shows the Motor Parkway from Horace Harding Boulevard heading south towards Union Turnpike. Note the Francis Lewis Boulevard to the east of the Motor Parkway had not yet been built. A closer look of the top half of this aerial shows another excellent view of the Motor Parkway entrance at Horace Harding Boulevard and, also, the North Hempstead Turnpike Bridge and the original Fresh Meadows Country Club at the curve. But, once again, there is no visual evidence of a toll booth straddling the road as seen at Springfield Boulevard. An even closer look at the entrance shows a small structure in the middle of the road. Note the thin black lines on both sides of this structure. Was this the Nassau Boulevard Toll Booth? More evidence was clearly needed. This 1939 aerial of the western terminus provides another excellent view of the entrance and the mysterious structure on the Motor Parkway. An opening can be seen to the right of this structure. Finally, I requested to examine any topographical maps of this section of the Motor Parkway. Eureka!!! I found this topo that showed details of the Motor Parkway before it was handed over to Queens County. Our small structure seen in the aerials was designated as a "booth" and the black lines were a "rustic wood barricade". 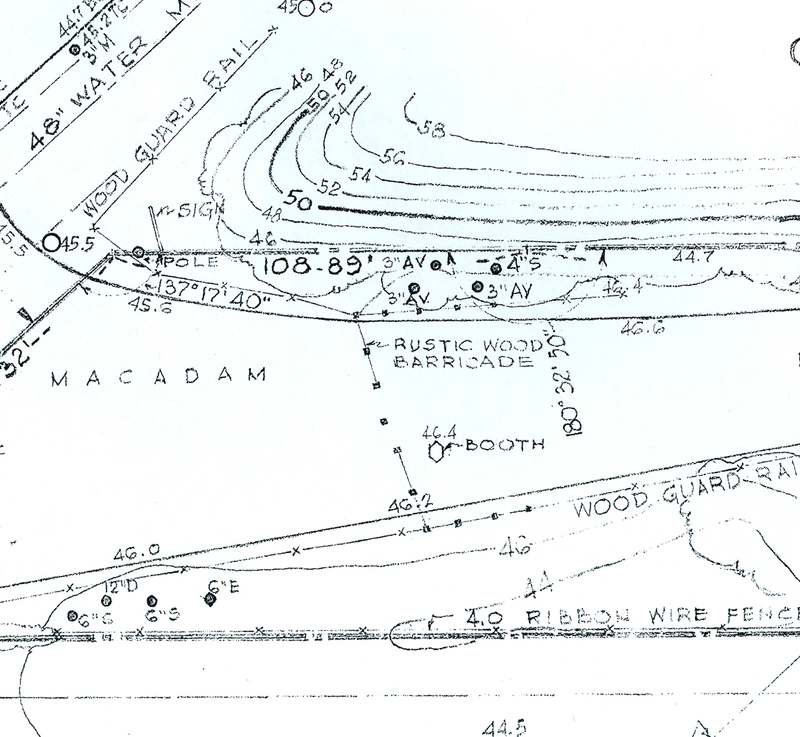 Note the other Motor Parkway labels in the topographical map including; the sign on the Horace Harding Boulevard corner, the wood guard rails,and the ribbon wire fence. Based on all this information, in my opinion, the Nassau Boulevard Toll Booth did not match the large structure seen at Springfield Boulevard. I believe the "booth" was a small kiosk surrounded by a wood barricade with an opening for cars. 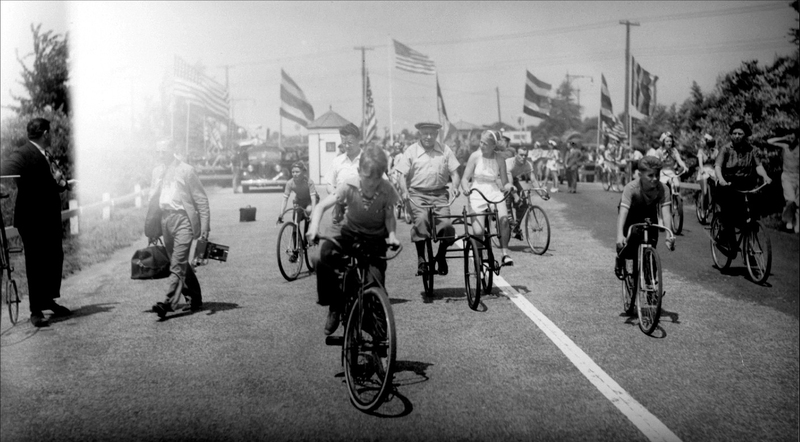 This structure was seen in the background of the Bike Path Opening Day ceremonies held on July 9, 1938. Finally, I discussed my "toll booth" theory with Steven Rizick, Director of Document Services for the City of New York Parks & Recreation. Mr. Rizick verified that it was highly unlikely that Parks Department built the kiosk less than three months after the 1938 closing of the Motor Parkway. "It was most certainly built by the Long Island Motor Parkway". Your opinions and comments on the Nassau Boulevard Toll Booth are most welcomed. Please send any relevant images to me at Howard@Kroplick.com . Howard, New to this site and believe what you are doing is vital and interesting. I grew up in Suffolk off Vanderbilt Motor Parkway (In that area Vanderbilt name is included) and always wondered even as a child how it was when it was the only Highway. Avid Automobile lover too and a novice. Super sleuthing, Howard! You’ve basically put this mystery to rest. A question about the two thumbnail photos on this page (both spectacular shots by the way). The lower one appears to show a rectangular cleared area to the left of the LIMP entrance…almost what I would imagine to be a parking lot. The upper one does not appear to have that structure. Is it possible that they were taken at different times—perhaps years apart? I should’ve said “the two aerial thumbnails on this page”. The topographical map thumbnail is also terrific, and is truly the “eureka” moment! Another thing that this shows me is that there was really no Peck Avenue at that time, and Francis Lewis Boulevard (or Cross Island Boulevard) was barely a dirt-covered country road that didn’t even extend to Union Turnpike. Thanks for the comments and the suggestions for the Queens research. I will track down the dates for the images later tonight. I have tracked down the dates of the aerials. The large aerial on top and the two subsequent thumbnails were taken on June 24, 1938- about two months after the closing of the Motor Parkway. The third thumbnail(click on the image for a larger view) was taken almost a year later on June 2, 1939. It does appear a section off Horace Harding Boulevard was made into a parking area. Excellent find!! Dear Sir: Just happened on your site. I grew up on 199 St and 51 Ave from 1953 on. I used to take my bike on the Vanderbilt Parkway. 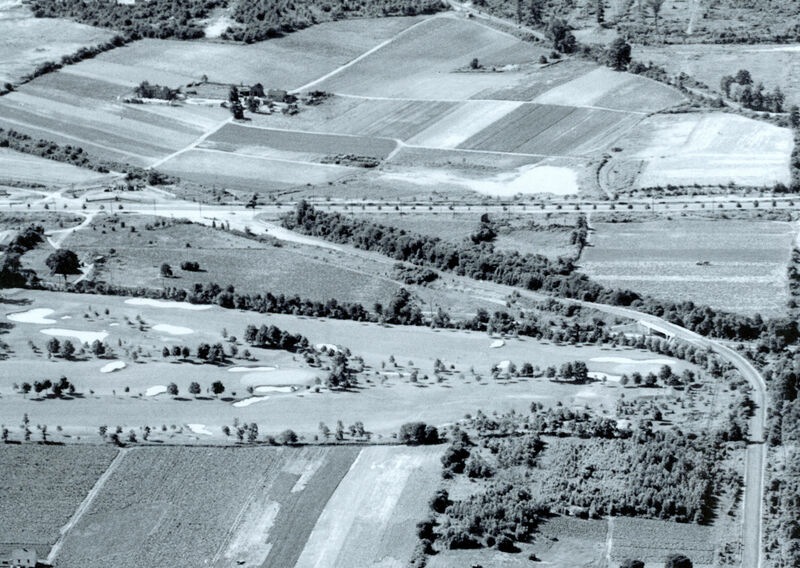 The 1939 aerial view is incredible. I can see just about where my house was eventually built. Hollis Ct. Blvd, the farms where 58th Ave and 196 St. would be. Francis Lewis didn’t open between HHB and Hillside Ave until just after the war. I remember when we moved in that the streets weren’t paved, that sewer lines had to be put in, and that most of our needs were met by vendors who brought their trucks in. Thank you. Great to see these images. I greww up in fresh meadows. In 1949 the garden apartments we lived in on peck ave were just being completed. A few years later PS 179(grages K-6) was built. Then came the long island exp. As kids we played on the construction site of it off peck ave(the exp cut peck ave in half), I could go on and on. But one thing I remmember was that a horse drawn carriage would deliver fresh milk twice a week to the door very early in the am, you left the money in an envelop in the emptees you put out. Your right about the lack of stores back then. Vendors would wind thru the neighborhood selling there wares and services. IT WAS GREAT! You can also see the rustic wood barricade gates on both sides just beyond the kiosk in the Opening Day pic, as exactly positioned and labeled in the topo map.